Offline Payments in Vend Ecommerce – How can we help? Offline Payment in Vend Ecommerce is a payment option that doesn't require a credit card or online payment authorization. The Offline Payment option work great if you'd like to offer bank transfers, payment on delivery or payment on pickup. 3. Type in a payment Name (Bank Transfer for example). 4. Choose a Vend Payment Type that you'd like this payment to be associated with when the sale is created in Vend (Cash for example). 5. Choose Offline Payment under Gateway. 6. In the Payment Instructions field enter the instructions that you want to appear on both the thank you page and on the order confirmation email. These should be detailed enough so that the customer knows what they need to do to pay for the item(s) they've ordered. 7. Finally, make sure Enabled is switched on to green and save your changes. To process an offline payment, your customer will need to go through all the checkout steps as usual but, when at the payment screen, select Offline Payment. (i.e Bank Transfer). Once your customer has clicked the Place Order button they will see a thank you/order confirmation page which contains the payment instructions. The order and payment instructions will also be sent out to the customer's email for their reference. Note: No payments are taken during this process as the transaction will take place outside of Vend Ecommerce. This order will now be viewable on your Vend Ecommerce Orders page and an On Account Sale will be created in Vend with all the necessary details about the customer and their ordered items. The order will be listed as Pending in Vend Ecommerce (or On Account in Vend) which means that the order has been successfully placed but that you are still awaiting payment. 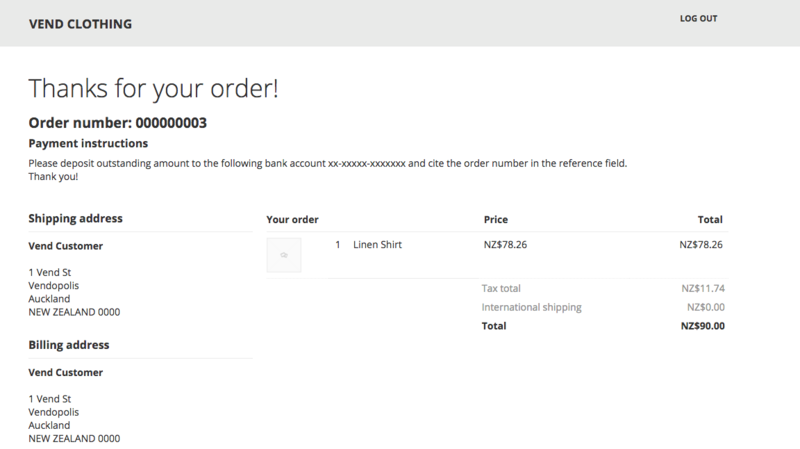 If you have already recieved payment for this order, head to the Orders page in Vend Ecommerce. On the Order Summary page, change the order status to Confirmed by selecting the Mark as paid button. 2. Click on the arrow to the right of this order to add it to the Sell screen. 3. Take the payment as normal. This will change the sale status to On Account, completed in Vend and update the corresponding order in Vend Ecommerce to Confirmed. If your customer has paid to your Xero account, complete the sale by navigating to the Vend Sales History, locating the sale and selecting Check for Xero Payments. This will change the sale status to On Account, completed in Vend and update the corresponding order in Vend Ecommerce to Confirmed. Once the order status has been changed to Confirmed you can follow the link here to learn how to ship the order. Can I format the payment instructions using HTML? 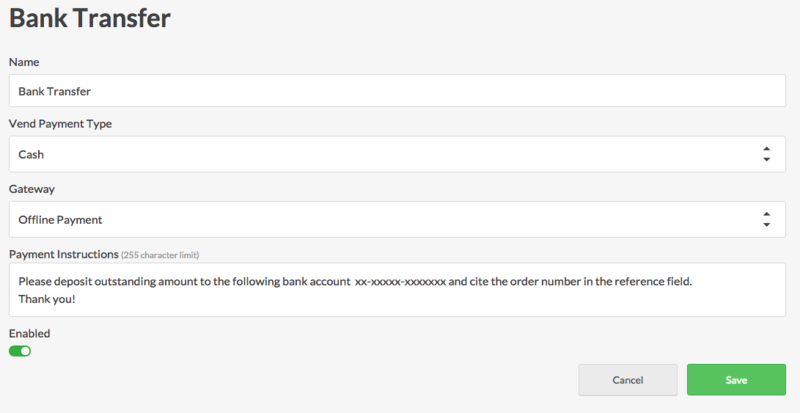 You are only able to add line breaks at this stage, we don't support html formatting for payment instructions.